How to buy the right Lumbar Support Pillow for Car? A lumbar support pillow makes long drives much bearable as it eases the numbness and pain that a driver may feel, after hours of sitting in one position. If you already suffer from back pains, a lumber pillow support can alleviate this so that you may endure the drive, even if you’re on the passenger or backseat. Some cars already have an integrated lumbar support for their seats but it’s not compatible for all people, considering the height and weight of the person sitting. 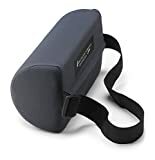 Therefore, it’s suggested that all travellers who spend a lot of time in their car for long travels and drives should get the right lumbar support pillow. This pillow helps support the natural curve of your spine so your back won’t feel tired or stressed even after maintaining a single position for hours at a time. What is a lumbar support pillow for cars? Instead of having a slumped posture while sitting on a car seat for hours, a lumbar support pillow helps the driver or the passenger have a correct posture that can significantly decrease the chances of lower back pains. Drivers and passengers can maintain a good posture no matter what condition their car seats are in with the help of this pillow. The good thing about modern cars is that it has options for seat adjustment that can add support to your lumbar area, you just have to check the manual. Some cars have already infused lumbar support in their car seats that are either adjustable or fixed but not all are effective because not all drivers have the same body shape and figure. Key Takeaway: Although these cars with lumbar support are recommended, you can still improve this support by getting something that will help you more, such as getting a lumbar support pillow for cars. Lumbar pillows are not that expensive; it can be purchased and there is a wide array to choose from. How to choose the right lumbar support pillow? Shape – The shape of your lumbar support is the most important thing to check out. Make sure that it maintains lordosis, or the natural curve curve of the back and spine just above the buttocks. You’ll notice that if you sit up straight, there’s a small curvature found in our upper and lower back. Find a pillow that would fill this gap. Firmness – The pillow must be firm enough as not to cave in by the pressure of your back. There are so-called memory foam pillows that capture the natural shape of your body. These foams are also firm and won’t easily lose its original shape. If you find that your pillow has begun to turn soft or powdery, it’s time to replace it. Stability – No matter how much you move during driving, the lumbar support pillow should stay in place. It’s not good when you have to adjust the pillow all the time while driving, as it’s unsafe to get distracted while you’re on the wheel. Get lumbar support pillows that has a strap that makes it adhere itself onto the seat. Airflow – Find lumbar support pillows that are capable of air circulation. It will ease discomfort caused by the heat after resting onto the pillow for hours at a time. Very few lumbar support pillows have cooling properties but you can just check the quality and the type of the cover if it is notorious for trapping heat. The best ones are made of mesh covers that are good for wicking heat and moisture. Price – The average price of a good quality lumbar support pillow is around $20 to $50. Cheaper ones tend to wear out faster and lose their shape, making it ineffective for supporting the lumbar area while more expensive ones tend to last longer. Key Takeaway: For optimum support and comfort, make sure to run these factors on your head while buying a lumbar support pillow. This is to ensure that you will get the right one for you. The most important factors are shape and firmness as they are the ones responsible for lessening back pains. What are the best lumbar support pillows for cars? This is a D-shaped lumbar roll that fills the gap on your back when seated upright. It improves posture and helps correct back pain. The roll is covered with a moisture-wicking mesh cover that keeps air circulation. This cushion can be easily installed on your car seat and can fit standard-sized seats. It is made from strong and durable fabric that doesn’t slide off the seat even without a strap. It also easily retains its firm shape while still being comfortable on the back. 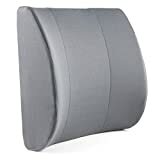 This lumbar support pillow is made of molded and highly resilient foam so that it doesn’t lose its shape and firmness even after years of use. It comes with a gartered strap so you can secure it onto your seat. The cushion is housed in a removable and washable cover that comes in the following colors: Black, Burgundy, Gray, and Navy. The right lumbar support pillow for cars depends on your choice, whether to have very firm or slightly softer, covered in mesh or thick cloth, or made of inexpensive foam or the slightly expensive memory foam. It really depends on you. When you find the pillow that is able to fully support your lower back area so that you’ll have an upright posture during long drives, then you definitely succeeded in your search for the right one.